I moved to Kansas City in 2008, fresh from graduating college and not too excited about residing in a "flyover" state. I was immediately surprised and quickly enamored with the Paris of the Plains. One year after arriving in KC, Matt and I bought our first home and committed to KC. One of our favorite things to do has always been to seek out and find the best spots to eat and shop in our city. Today I'm bringing you a comprehensive guide to my favorite places. You will never wonder where to go or what to do in KC again! Broken down by neighborhoods, this guide is meant to be a reference to come back to and read again and again when you are in need of a cool place to take friends or the perfect spot for date night. Explore your city friends because our beautiful "flyover" has so much to offer! Westport is the cool kid neighborhood of Kansas City, you're sure to spot a hipster or two and lately, it's seen an influx of noteworthy local restaurants and bars open their doors. Known as one of the prime nightlife areas of KC, Westport is chock full of things to see at any time of the day. Grab a macaron or brown sugar bar (trust me) along with lunch at Baked. Enjoy ice cream at Murray's. Shop the vintage racks at Boomerang, or local made goods at Mash Handmade. If you are around Westport during the day, make sure to stop by my favorite shop in all of Kansas City, Pryde's Old Westport. It's a charming kitchen emporium with more gadgets and dishes than you can possibly imagine, and on the weekends The Upper Crust pie shop sells baked goods on the bottom floor. Two other noteworthy shops in the area are Normal Human & Bunker, both are sure to fix your need for some awesome Kansas City apparel. If you find yourself craving Mexican, Port Fonda's famous food truck was in such demand that the owners opened their standalone restaurant a few years ago and it's been a popular spot ever since. Kansas City is ubiquitous with barbecue and we have more places to buy pulled pork than the average city, but I'll point you to the best of the best- CharBar is the new kid in town in Westport and they are doing it right. Make sure to get the hush puppy appetizer, it's freaking amazing, and the burnt ends might be the best in the city. Speaking of delicious food, Westport is home to my favorite restaurant in all of KC- Bluestem, where chefs Colby and Megan Garrelts are sure to wow you with their exquisite menu, so if you have a special occasion or cause to celebrate, make a reservation at Bluestem, you won't be disappointed. The River Market neighborhood is home to one of the Midwest's biggest farmer's markets, the City Market. 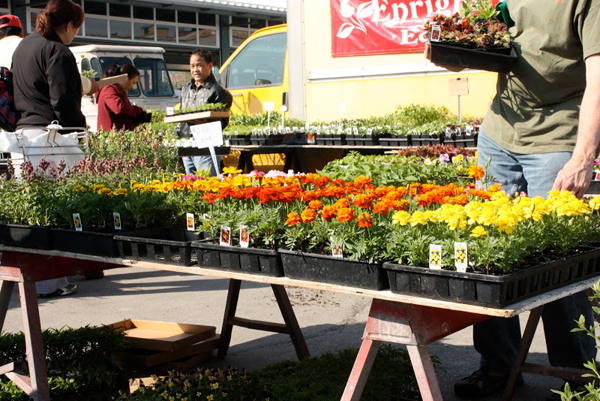 It's a must stop on a Saturday or Sunday spring through fall to pick up fresh produce from local farmers or any of the other many items that local producers bring to sell at the market. You are also sure to find street performers of all kinds, bounce houses and other entertainment within the popular farmers market. The market is located in a square block that has permanent restaurants, shops and vendors along the periphery of the square and the stalls in the middle are filled with farmers on Saturday and Sunday mornings. Some of my favorite permanent vendors are located in the city market including Beignet, a New Orleans inspired dining spot that offers delicious beignets, gumbo and the best bread pudding you'll ever eat. I also love Bloom Bakery, where you can pick up a croissant or delicious loaf of brioche bread, stop for lunch at Taste of Brazil and enjoy rice, beans, and traditional Brazilian dishes alongside a few pa de queijo, little cheese breads that are heavenly! If you are in the mood for some history, take a tour inside the Steamboat Arabia Museum and after, walk through the fun and eclectic Dutch Flower shop. Around the corner from the city market, you'll findHoundstooth, an upscale menswear boutique, Quay Coffee (a favorite local spot) and River Market Antiques that houses a huge multi-level collection of ever-changing antiques to shop from. Nearby you can also find the quaint neighborhood breakfast-lunch spot Happy Gillis where everything is good. If you're looking for something fun to do, you should check out Breakout KC or the Escape Room, these two venues let you enter into different live action puzzle games where you try to escape from different themed rooms by using clues to solve puzzles. Take a group of friends and try to escape! The West Bottoms is a cool industrial area that comes alive during the first weekend of every month. You'll find warehouses that suddenly open up to showcase cool antiques and vintage finds from furniture to housewares to clothing. A few of my favorite spots to stop at are Good Juju, Bella Patina,Goldie & Myrtle's, and Restoration Emporium. If you're all shopped out or need a minute to fill your tank to keep going, stop at Geneesee Royal Bistro for breakfast or lunch or if it's later in the day, grab a drink or dinner at Voltaire. Every KC resident should make a trip to the West Bottoms during the first weekend of the month, you are sure to go home with something unique. The Crossroads area of downtown is where the artist community likes to congregate. There are galleries and studios all over which means a great deal of cool places to eat and shop abound. Start at Hammerpress, it's a local printmaking studio that has a cool store front with posters, notebooks and other fun finds while in the back of the house you can see the printmakers working hard on custom orders. Down the street from Hammerpress, you'll find Pizzabella, where this great pizza and a killer cheese plate. Around the corner is 18th street, which is home to YJ's snack bar a fun hangout spot for the artists in the area. Stop by the Sundry, a new grocery and deli concept that is serving up all local food and goods with a great rotating menu. The Crossroads really comes alive on the evening of thefirst Friday of every month, when every gallery and artist studio opens its doors and welcomes anyone in to view and shop. During the first Friday evenings, you can find a full parking lot of food trucks at the lot at Wyandotte & 21st Street with enough options to satisfy any craving you may possibly have. 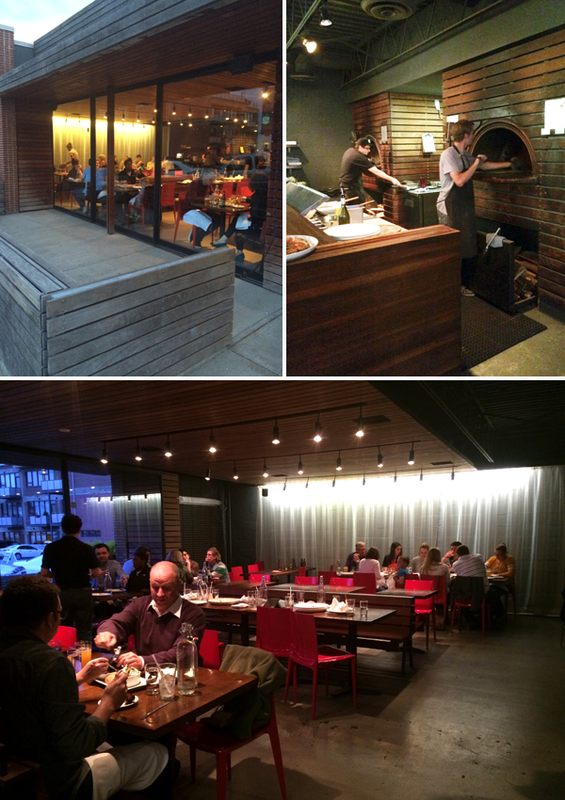 The Jacobson has a noteworthy menu and a beautiful patio for an outdoor meal and people watching. A little further east in this area is Tannin Wine Bar, which is a self-described "food-obsessed wine bar" with delicious small bites and an ever-changing menu. Across from Tannin, you'll find Fable, a cool women's wear boutique showcasing local designers. A few blocks over, make sure to stop at Christopher Elbow and enjoy some local chocolate. If you're in the mood for a cool concert, check out the schedule at CrossroadsKC, a great outdoor music venue. If you want a taste of Italy, then you'll need to go to Lidia's, where famous chef Lidia Bastianich is sure to satisfy your craving for decadent pasta. Not too far from the Crossroads is a little strip of shops on Southwest Boulevard known as the Latin area of town. You might feel like you've entered another country and only stepped a few short feet past the galleries of the arts district. Lining Southwest Boulevard is some of the most authentic Latin-American food you can find in Kansas City, including Empanada Madness, La Bodega and the best place to buy a freshly made Popsicle, Paleterias Tropicana. If you keep driving down Southwest Boulevard, there is no way you can miss the airplane coming out from the top of the Roastariebuilding, it's their impressive coffee roasting facility where they make the well-loved Kansas City coffee. Give them a call to find out when they give free tours. West of the Crossroads, up on a hill, you'll find the charming little 17th & Summit neighborhood that despite its small size, has a fabulous collection of eateries. The Bluebird Bistro is known for its farm to market food and the breakfast is worth a taste. While you're there, grab a sweet or savory crepe atChez Elle or try the all vegan fare at Fud. A bit more upscale and romantic; Novel offers a unique menu worth trying. If it's a Saturday night during the summer months you'll want to get down toFervere bakery at about 5:30pm and wait in line (that's right, I said wait in a line) with other food obsessed folks for a cheese slipper. What's a cheese slipper? Basically an artisan flatbread with different local and seasonal toppings baked to perfection in the stone oven. They only make them on Saturday nights during the summer. Just around the corner, Little Freshie is a favorite among locals, a little soda/coffee shop formerly a snow-cone truck that now offers its handmade syrups in snow-cone, soda, or float form. I highly encourage you to try the mango ginger or blackberry lavender, grab one after you down your cheese slipper. Another fun area of town is the West 39th Street neighborhood right around the KU Med campus. It's one street full of shopping and restaurants that's a lot of fun to walk around. Donna's Dress Shopshould be on your list for shopping; a beautifully curated collection of womenswear with an emphasis on 50-60's style. If you're hungry, you have a great selection of eats to choose from including: Room 39- the oven eggs on the breakfast menu are one of my favorite brunch dishes ever; Jazz- a Louisiana style restaurant; Anna's Oven- which serves up home-style comfort food and Blue Koi-serving Asian fare. After you eat, make sure you stop by Prosperous Books, it's a charming little bookshop. Not too far from these spots is quite possibly the Kansas City BBQ favorite- Joe's KC, formerly known as Oklahoma Joe's, is inside a gas station which only adds to its charm. It's known as a top contender for the best BBQ in the city, get the Z-man! You can't come to Kansas City without a trip to Country Club Plaza, it's the first suburban shopping area west of the Mississippi and its architecture was designed after Seville, Spain. It's a destination that shouldn't be missed. It's our premier shopping center with stores ranging from Coach and Kate Spade to Moosejaw and H&M. While walking around, stop into The Better Cheddar and sample hundreds of cheeses before settling on the slices you'll take home with you. There are two stores that cannot be missed- Standard Style & Baldwin, both are owned by the same local KC couple. Standard Style houses some of the most fashion-forward brands that you'll find and Baldwin is the couple's own line of denim that won them a coveted spot as a top 10 finalist for the 2015 CFDA/Vogue Fashion Fund. Walking through the prestigious shopping area is sure to make you hungry, I recommend eating at Gram & Dun on the patio if its nice weather, everything is good. If you're in the mood for something sweet, you'll need to get a cupcake at my favorite cupcake bakery in KC, Cupcake A La Mode, or pick up a few macaroons at Natasha's Mulberry & Mott. Jump in your car and head south a few blocks to get ice cream at Glace, it's the ice cream incarnation of Christopher Elbow's chocolates and it's to-die-for. No visit to Kansas City is complete without a walk through the Nelson-Atkins art museum. The permanent collections are beautiful and there are always traveling exhibitions to see as well. Close to the plaza is the Spencer Theater where the Kansas City Rep Theatre shows fantastic work - check the schedule and get tickets even if you aren't familiar with the play, this company never disappoints! Just south of the Plaza is the charming neighborhood of Brookside. Every time I venture to Brookside I wish I lived there. There are several noteworthy spots to eat and shop including: Julian, which is owned and run by Celine Tio; The Roastarie local coffee company has a fun little coffee shop here; and a newcomer to the scene is Heirloom Bakery, causing quite a stir with their fresh baked goods. In my opinion, the gem of Brookside is Bella Napoli, the most authentic and mesmerizing Italian food I have eaten outside of Italy, which is found in this quaint little neighborhood restaurant. Go there and eat, trust me! There are a dozen or so cute little shops residing in Brookside, so take an afternoon and eat some Italian and walk around. We live in the Northland, or the area north of the river, near the airport and so I would be remiss if I didn't tell you about a few of my favorite spots in my own neighborhood. First stop would be Briarcliff Village, a charming shopping center just north of the downtown airport. Trezo Mare serves up Italian inspired cuisine that never disappoints, the patio is beautiful and offers a great view of downtown. Next door to Trezo Mare, make sure to peruse the interior design mecca of Nell Hills and make an appointment at The Spa at Briarcliff where you can enjoy soaking in the European bath ritual room before any service (it's my birthday treat every year.) Briarcliff is home to lots of other fun shops including the Land of Paws, Design in the City and an organic market, Green Acres. Just down the street from Briarcliff is the last BBQ joint I will list- Hawg Jaw Fritz, it's won awards and is worth a stop, especially if you're in the Northland and don't want to drive downtown to Joe's. Historic Parkville is a worthy of an afternoon of shopping and nibbling. Stop by the French Bee bakery and enjoy something coming out of the oven, walk down the main street and in and out of cute little shops and make sure not to miss the Parkville antique mall. Grab some dinner in one of the area's best French restaurants at Cafe Des Amis. A little farther north is the Zona Rosa shopping area where you will find all your typical mall stores, along with a great Marshall's, a delicious Italian restaurant Bravo, a really good Indian restaurant,Swaggat, and lots of events and festivals that happen year-round. Across the main street from the shopping center is a little strip mall that is home to our very favorite Mexican restaurant- Ixtapa, the creamy chipotle chicken will make you keep coming back. Down Barry Road a few blocks is Ditto, a resale boutique where I always find at least a few things to take home at the most affordable prices. If you travel East down the 152 you'll come to Liberty. Liberty has a cute little historic town squarewith a few noteworthy places to try- Ginger Sues for breakfast is a must and La Tienda Chiquita might have the best carnitas I've ever eaten. We also love the wraps at Longboards & the Pad Thai at Tasty Thai, both are in the Liberty area. There are two other restaurants that I must tell you about that don't fall into any of the neighborhoods I've listed for you. They are Story and Renee Kelly's Harvest. Renee Kelly is a charismatic talented chef who I have had the pleasure of working with and dining at Harvest multiple times; it's always a beautiful dining experience with perfect flavors and ingredients. Her restaurant is in an old castle, which adds to the charm of the entire dining experience. Story is located in prairie village and is a close second for our favorite restaurant with Bluestem. It's one of those meals where you leave having eaten menu items that you have no idea how to prepare and are in awe of what you have just eaten. The perfect venue for a special occasion.